When it comes to long haul flights, my favourite airline is as you might know Emirates because of their superior product and experience. 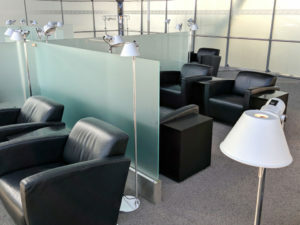 However, being open minded we use other airlines frequently, such as the German Lufthansa. 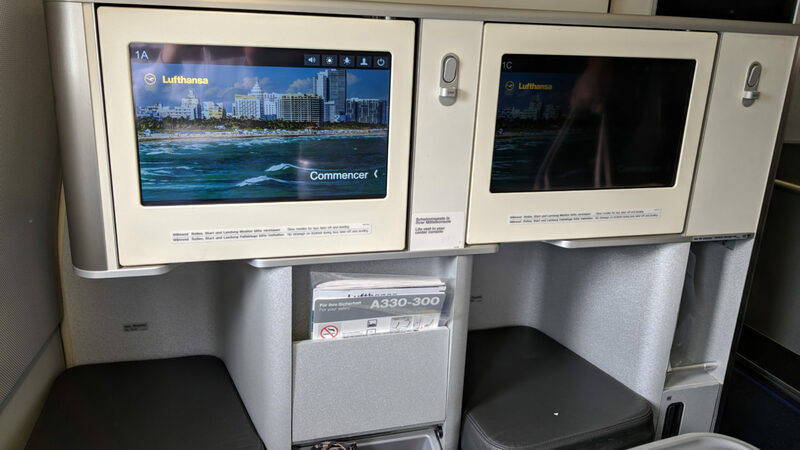 On our last trip, A&I headed from Munich to Miami in Lufthansa Business Class on their A330. Beforehand I don’t keep it much of a secret that I’m no Lufthansa fan. It’s the airline with the biggest disparity between marketing and reality in my opinion. Also prices for some of their routes are just ridicolous especially in regards to the product you get. 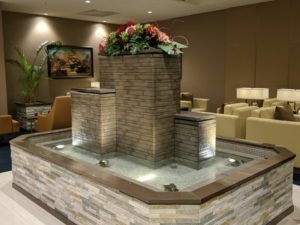 Prior to flying, I found the Lufthansa business class lounges to be a bit underwhelming too. 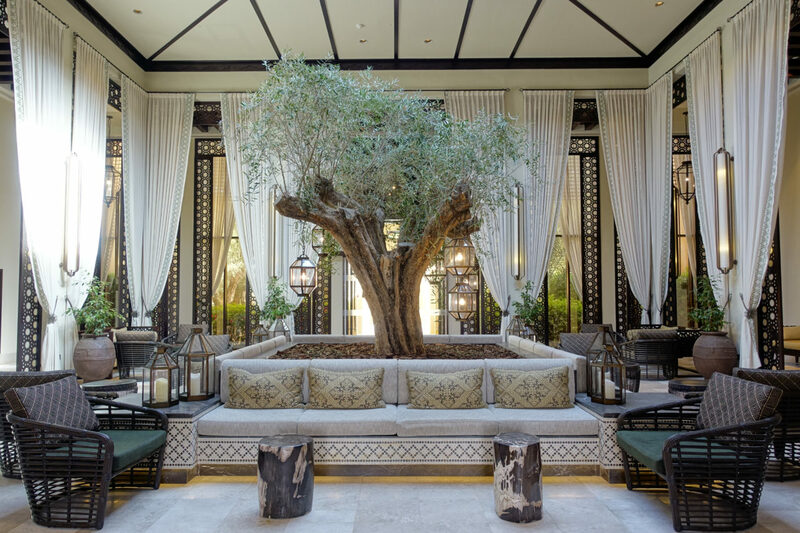 Consequently, my expectations were not too high – however I must admit that they were exceeded. Before heading to Miami from Munich we had a domestic flight that was operated by LH instead of Eurowings (yay!) This flight was nothing special but I’ve never taken domestic business class before. You basically get to sit in the front of the plane with the middle seat empty which is a nice treat. Even on just 45 minutes flight time you get a proper meal and open bar drinks. Two features I would not exactly pay any extra for though. 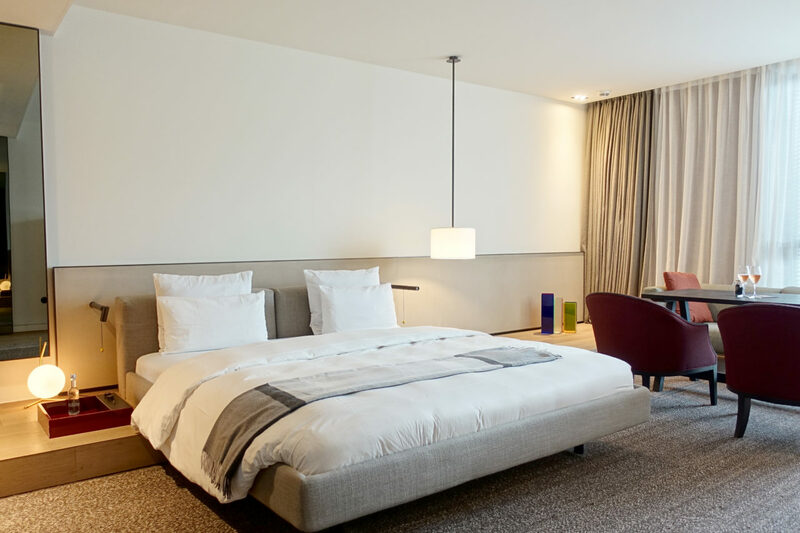 We stayed one night at the great Hilton Munich airport before heading to MIA the next morning. Boarding for our daytime flight had a slight delay but was smooth otherwise. We had bulkhead seats in row 1 on their A330, a two class cabin configuration with a 2-2-2 seat layout. Our configuration did not have a First Class but two Business Class cabins alongside 28 Premium Economy seats and 85 standard Economy seats. The cabin has a open space philosophy which makes it light and spacious at the cost of privacy. 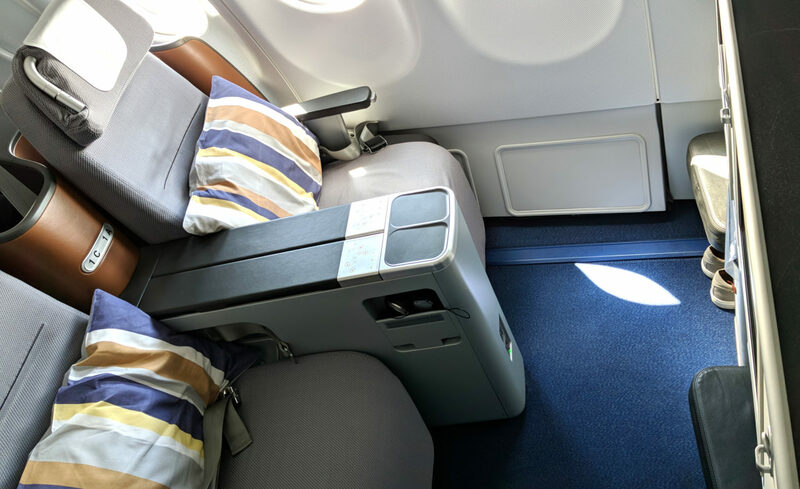 Pro tipp: If you prefer a more intimate atmosphere, try to opt in for the second, smaller business cabin with rows 10 and 11 (just 12 seats). Seats A&C as H&K are facing sidewards in parallel while the center seats D&G are both facing torwards the middle (feet touch 😊). The seat is way better than expected and quite firm for my taste. Through the armrest panel you technically have the ability to adjust the firmness from hard to soft but I didn’t find it much different. Aside from the lounge and lie-flat sleeping positions you also have a (slight) massage function. A gem is the legrest which was pleasantly long so you could comfortably crouch during a movie or even bend your legs sidewards. 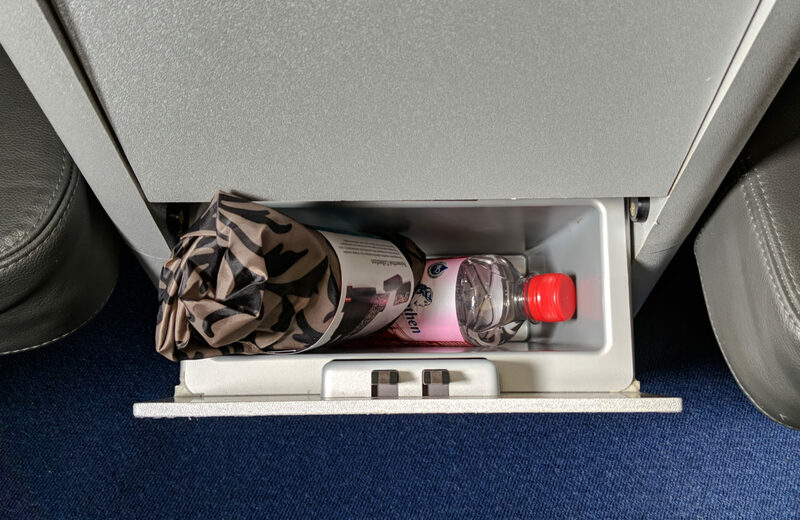 The storage options in direct proximity to your seat are solid and you can settle in comfortably. Other than that the seat features a hook for your glasses (neat! ), power outlet, reading light, controller-handset and a little cocktail table in between. The wide seat was lie-flat with a rather spacious compartment for your legs. Located in a “library” stowage in front of our seat was a nice selection of (mostly German) magazines to enjoy. The inflight entertainment is decent. The non-touch screen is not the largest in its league but the selection of movies and music is good. You receive noise cancelling headphones by BOSE that did a great job. The plane was equipped with inflight WiFi which was roughly €17 for the duration of my flight. 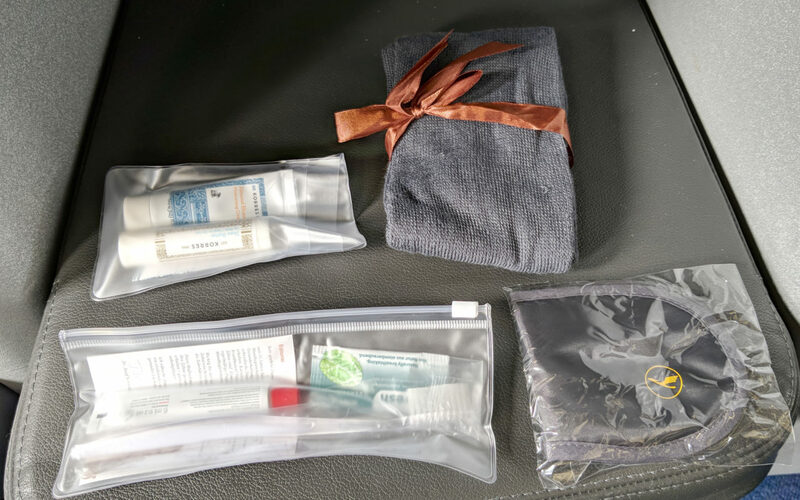 Blankets and pillows were provided as was an amenity kit inside a tote bag in an slightly awkward military design. On many daytime flights you don’t get an amenity kit anymore so I found this to be a nice touch. The service on our flight was friendly and attentive with an obvious difference between short- and long haul cabin crew in my opinion. 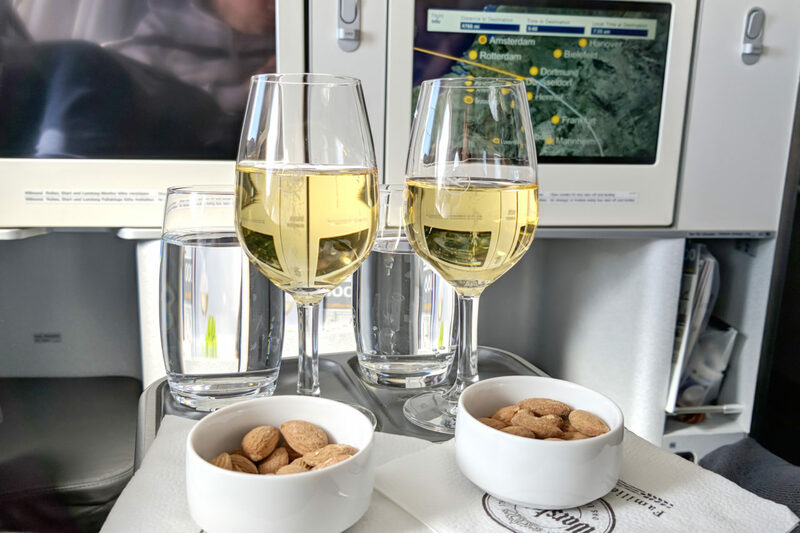 Prior to departure, a drink is offered (no champagne which is unique to Lufthansa) and as soon as you are airborne, you are about to enjoy some nuts and an aperitif. 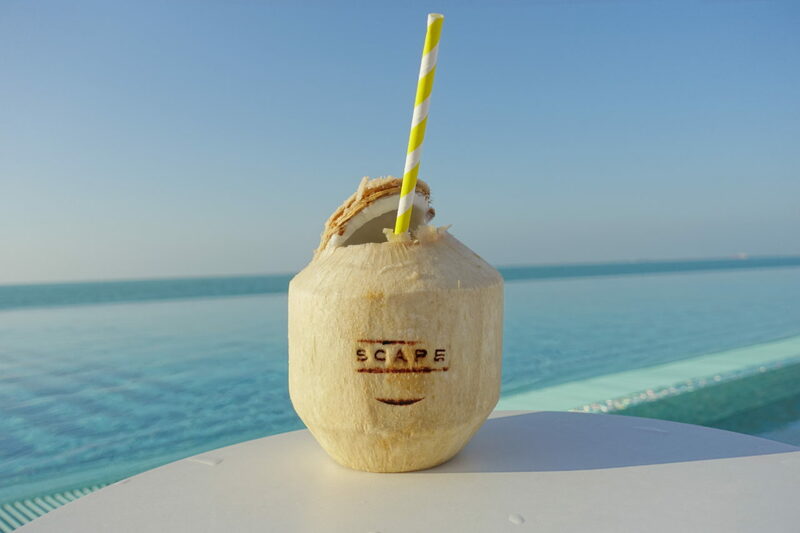 The menu lets you choose a starter and main course, all of which have been of decent taste and presentation. 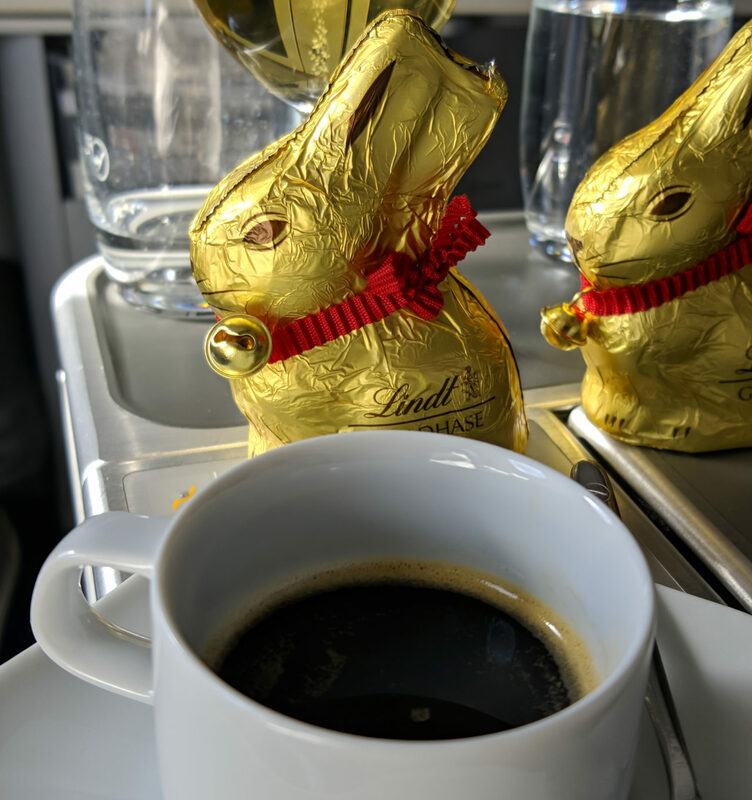 We just had coffee and tea for desert and because it was easter season were handed a Lindt gold-bunny which was again a nice touch off standards. 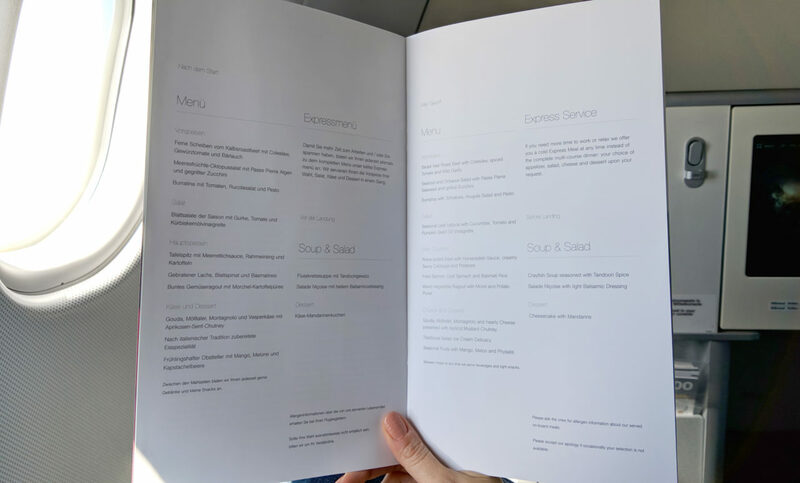 Although there was no bar like on Emirates, between the service hours there was a small pantry set up in the galley between the business class compartments. 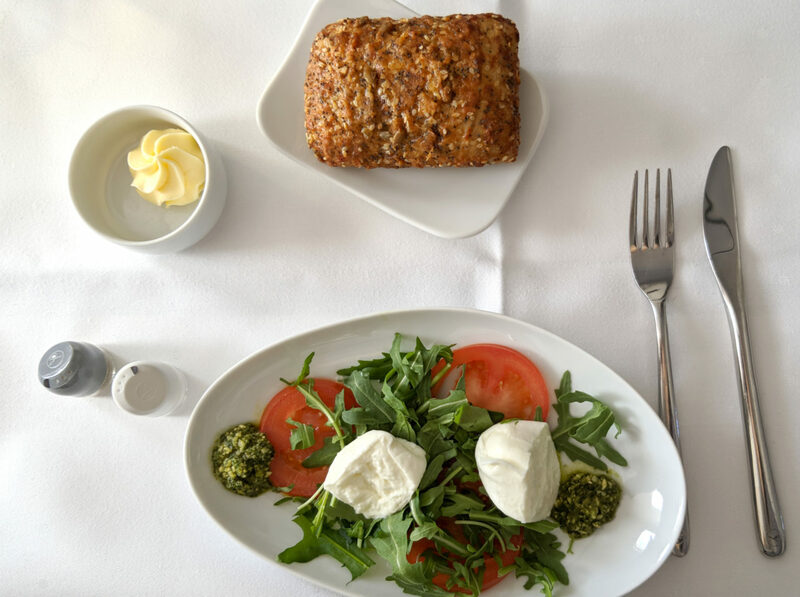 You could get fresh water or drinks as well as light snacks, ice cream or crackers anytime during your flight. 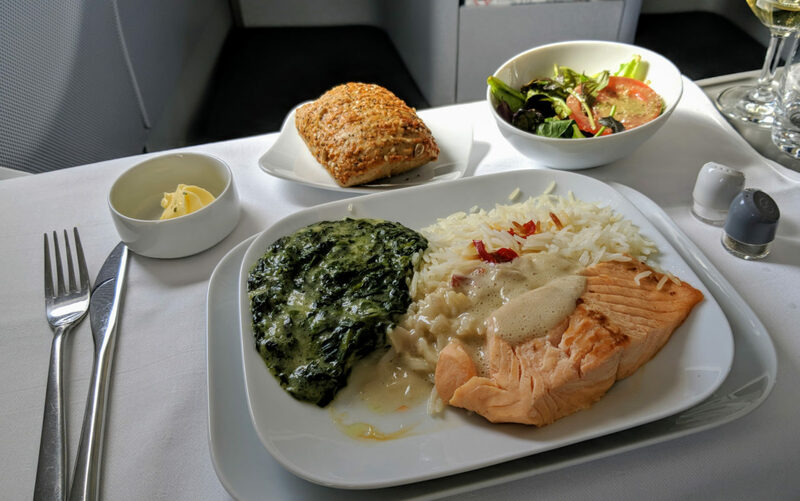 My business class flight with Lufthansa was a pleasant surprise. While I remain confident that LH is not offering the best price/value ratio, I found their product to be above solid upon experiencing it. Most notably the great seat was a big plus and the attentive service was a big surprise which made time fly. 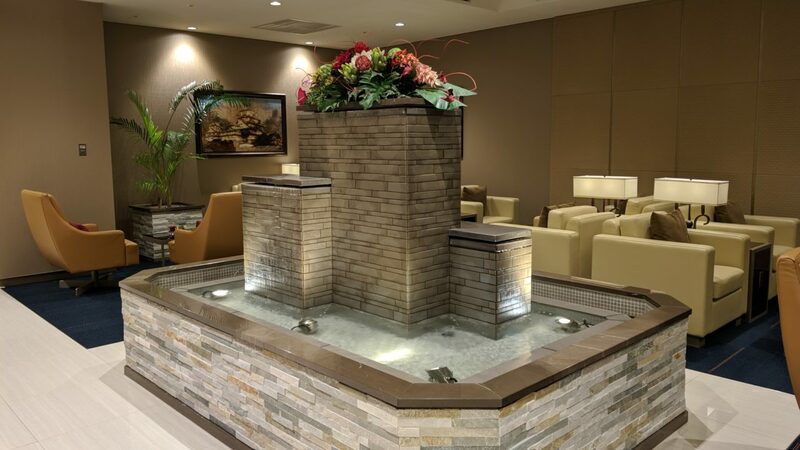 Field for improvement is in ground handling though – neither the lounges (in Munich and Miami) nor the pre-fligt experience have been remarkable. 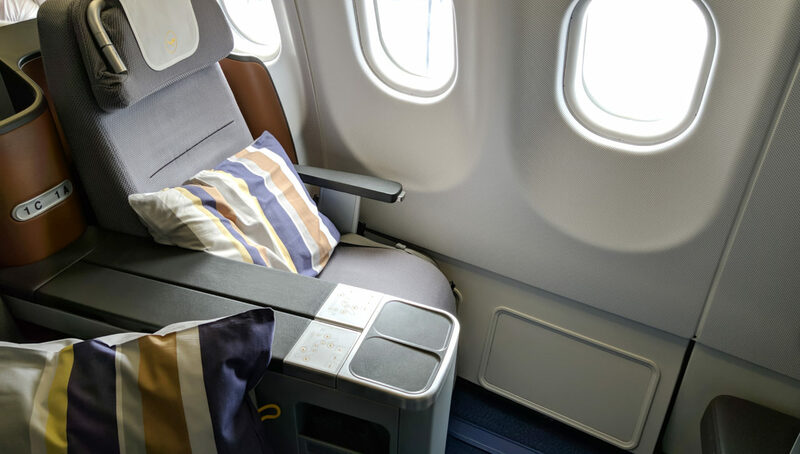 Want to check Lufthansa fares to experience Business Class on your next flight? 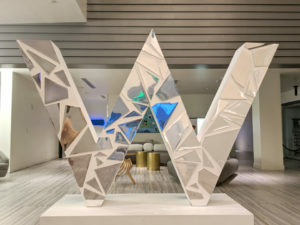 If you like, read more about this trip, such as staying at the W Fort Lauderdale. Have you been flying Lufthansa? What’s your take on the airline? Let me know in the comments!